Games like the Galaxy ZEGA help you ​have fun with your kids. There are growing concerns that kids are spending too much time on their smartphones and tablets. However, it may not be a bad thing if parents use this to spend more time with their children. Should You Buy the Galaxy ZEGA? According to The Telegraph, 22 percent of parents think that playing computer games helps their kids to understand technology better. Meanwhile, around 80 percent believe that they are spending quality time with their children while playing video games. The Galaxy ZEGA aims to be fun both for you and your kids. It is a real-life tank battle game that also appeals to kids because the exciting video game elements it offers. Kids have been playing with tank battle games since the days of the Apple II. It is easy to understand the allure of battling in a vehicle that not only flattens everything that crosses its path but also levels buildings with just one shot. Until the Galaxy ZEGA, however, tank battles were limited to your computer. This time, you have everything laid out in your living room. With the Galaxy ZEGA, you can play with real tanks. You control these tanks with your mobile phone. The tanks would fight each other on a battlefield. You can make your attacks more potent by unlocking skills, getting power-ups, and adding lifetimes. You can also speed up your tank or fortify your defense with these power-ups. The Galaxy ZEGA is an updated tank battle game with different components. What makes this toy special? Image: Video screen capture, Galazy zega, via YouTube, caption and filter added. You can play with up to four ZEGA tanks, and each one of these automatically connects to your smartphone or tablet using Bluetooth. The Bluetooth connection allows the tanks to get up to 100 instructions per second, making the handling and control very fluid and responsive. You might be fighting it out in with real-life tanks, but some video game elements make this more fun. For one, you can earn virtual gold that you can use to make your tanks better, faster, or stronger. Then there are at least 30 skills that can either weaken your enemy's tanks or increase your team's attack and health points. Using a combination of these skills can also help you win the game or get out of particularly tricky attacks. The Galaxy ZEGA comes with expandable battlefields with modular tracks that you can quickly connect because of the magnets at the sides. With a variety of components, each battlefield you create is unique, allowing you to have something new to play with every time. There are two gameplay modes that you can choose. First is the survival mode, where you try to chase each other's tanks. You "fire" at the other tanks and you get points when you "hit" them. ZEGA tanks have LED lights that flash when you fire. Your opponent's tank has sensors that will detect the lights and know when hit. When it gets hit, the other tank will spin around, and your opponent will lose health points. The mobile app will tell you how many health points remain. You can "kill" an opponent in five hits. Then you have the "Capture the Flag" mode. For this mode, you will need to have the optional X-base tiles added to your battlefield. In this mode, the color of the X-base will match the color of your tank, signifying that it is your flag. The objective is for you to capture the other team's flag by driving on the X-Base that has their flag's color. Speaking of X-bases, you can also use these in survival mode. When a tank goes over the X-base, they can recharge their health points, or use it to upgrade their weapons. If you want to save while buying the Galaxy ZEGA, then get the Starter Kit. The starter kit gives you the Leo and Gondar tanks, a battlefield with a dozen tiles, and 16 walls. You also get all the connectors and the stickers for both the battlefield and your ZEGAs. Each battlefield has 12 tiles that you can connect. The tiles are magnetic and can be arranged in different ways, allowing you to have a different battlefield for every match if you prefer that. The Galaxy ZEGA Battle Toy Starter Kit has not been reviewed on Amazon.com. However, it does get a "B+ Recommended" rating from iLounge. Having a B+ grade means that, for iLounge, the product is "very good." These are products that they would recommend to specific but large audiences, such as kids or teens. The Galaxy ZEGA Battle Toy Starter Kit sells for anywhere from $55 to $190 on online retailer sites such as Amazon or Apple's online store. Individual components are also available. For instance, if you want the ZEGA Razor or Puck, you will need to pay around $105 to $110. An additional battlefield will set you back roughly the same amount of money. What the starter kit does not have is the X-base, which can help make the games more exciting and fun. The X-base is available for around $30 to $35 from the company's online store. To write this review, we checked out the SmartX Galaxy website and its online store. We also looked at the product listings on online retailer sites. We also read reviews from the Huffington Post, iLounge, and other credible sites. The Galaxy ZEGA is somewhat unique, but there are similar toys that you can buy. 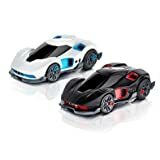 How does the ZEGA compete with Anki Overdrive: Fast & Furious Edition, WowWee Robotic Enhanced Vehicles, and Kid Galaxy Remote Control Bump 'n Chuck Bumper Cars? The Anki Overdrive: Fast & Furious Edition allows you to race cars with your kids using smartphones or mobile tablets. You get a modular racetrack that you can assemble into different racing courses, as well as great looking cars. You can also enjoy the new mobile app with its in-game features. There is also an option to play with artificial intelligence if you are playing alone. If you win, you will earn some in-game cash that you can then spend to unlock accessories, characters or weapons. The updated slot car racing game also has some cool tie-ins with the movie franchise. You can choose to be Tej, Hobbs, Letty, or Dom. As you drive your car, you can see the character art on your device screen. They also included in some character dialogues. Ratings for the Anki Overdrive: Fast & Furious Edition average 4.3 stars out of 5. Verified buyers love how they can join the fun with their kids. If you have always wanted to spend time with your kids, this might be the toy to buy. They also like that you can combine this edition other Anki Overdrive editions to make longer tracks. However, some users complain that the app is sometimes buggy and that Anki's customer service is not that helpful. Meanwhile, others warn potential buyers to make sure that they have enough space for the track. Prices for the Anki Overdrive: Fast & Furious Edition range from $135 to $160. The WowWee Robotic Enhanced Vehicles is a cross between the Anki Overdrive and the Galaxy ZEGA. Instead of tanks, you get cars doing the fighting. You would need to pair these cars to your smartphone to control them. After connecting the car to your mobile device, you can immediately start the battles. Like the Anki Overdrive, this one allows you to play against the computer with AI. Or you can gather up to 15 of your friends, each one with a WowWee REV, and start having fun trying to demolish each other's cars. You can destroy other vehicles by colliding with them. Or you can use virtual machine guns, EMP bombs, and other weapons to do so. When you sustain damage, you can get health packs, and shields to make sure that you stay in the game longer. If you beat AI characters, you can unlock features and weapons. As a bonus, the WowWee REV acts like a real car in an actual collision. For instance, if you ram a car from behind, it will lunge forward. But if you crash into a car from the side, it will change its course. The WowWee Robotic Enhanced Vehicles receives a rating of 4.4 stars out of 5 on Amazon. Users love how the REV can run on different floor types, including those with thick rugs. They also like both the AI and the two-player mode, as well as how responsive the cars are to the controls. Others note that there is a slight learning curve when it comes to mastering navigation. There are some complaints about how the app crashes too often, too. Nevertheless, you will still want to try the WowWee Robotic Enhanced Vehicles because of its affordable price tag, which ranges from $28 to $70. The Fun of RC Cars, PLUS Interactive Play: Race around and bump your opponent to eject their driver! The Kid Galaxy Remote Control Bump 'n Chuck Bumper Cars are perfect for parents who have younger kids. 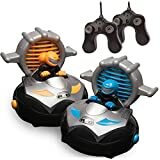 If you do not trust your kids with their own smartphone or tablet yet, then they will still be able to have fun with the Kid Galaxy RC bumper cars because of the included remote controllers. These bumper cars allow your kids to race and bump against their opponents. With bright colors and sound effects, younger children are going to enjoy this game. It is effortless to maneuver the bumper cars using the remotes. Plus, the goal is simple: to eject your opponent out of his seat. The Kid Galaxy Remote Control Bump 'n Chuck Bumper Cars has a rating of 3.5 stars out of 5 on Amazon. Customers love this toy because their toddlers and younger kids can have fun with it. However, there are complaints that this toy uses a lot of batteries and can break easily. Prices for the Kid Galaxy RC Bumper Cars start at $85 to $105. Users of the Galaxy ZEGA will love how well it works. They will also like the tracks that quickly snap together to form a variety of patterns. You get a different battlefield for every session. You will love how the ZEGA needs only 1.5 hours to recharge, but you can play with it for 2.5 hours. If you are not buying the starter kit, you can buy the ZEGA tanks and still have fun, because you can run these tanks on any surface you want. Smart X sells additional ZEGAs, battlefields, and other components separately. But these can be more expensive than the starter kit. You also cannot choose the tanks that come with the starter kit. There are four different ZEGA tanks: Leo, Gondar, Razor, and Puck. Out of these four, the starter kit only includes Leo and Gondar. If you want to get all four tanks, you will need to buy Razor and Puck separately from the Smart X online store. The ZEGA vehicles are very easy to control and handle, but there are times that they flip over. The Galaxy ZEGA is a multi-player game, but you cannot have battles if you are alone. There is no artificial intelligence for this toy. You would need a human to control and run the tanks. If you think about it, these toys represent an updated version of the games today's parents played when they were kids. The Galaxy ZEGA is an updated battle tank game, while the Anki Overdrive is a slot racing game. Meanwhile, the WowWee REV is more of a demolition derby. Lastly, the Kid Galaxy is a toy version of bumper cars. But what all of these toys have in common is that these all help you spend quality time with your children and have fun. The Galaxy ZEGA brings together remote control cars, video games, and battle tanks all in one game. You and your kids will undoubtedly have a lot of fun with this toy, and it is not difficult to recommend. For less than $200, you can get an exciting and fun game that can guarantee hours and hours of smiles and laughter for you and your kids.